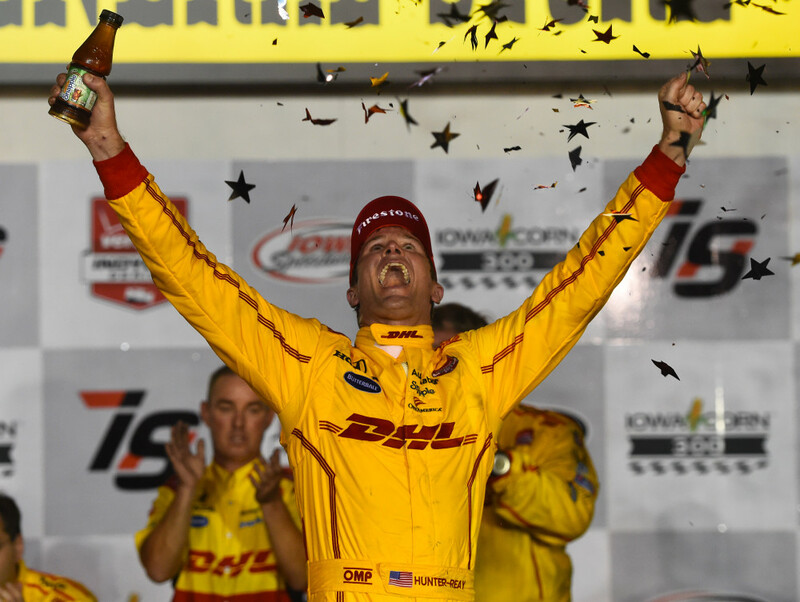 Indy 500 winner Ryan Hunter-Reay won Iowa for the third time Saturday night, but twenty year old rookie Sage Karam stole the show, swerving and chopping his way to third for his first IndyCar podium finish. Clearly on a roll the last several races, in short Sage went wild. 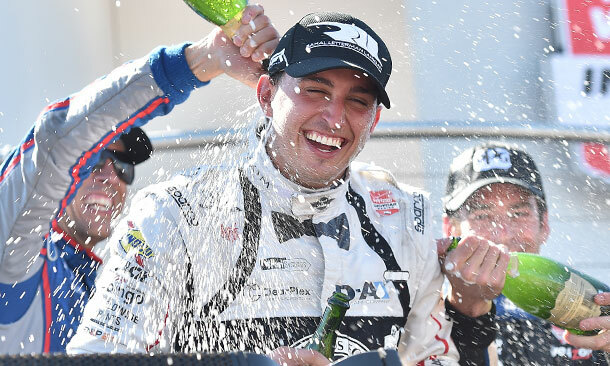 Josef Newgarden led much of the latter stages of the frantic race only to finish second while Graham Rahal led another charge from seventeenth to fourth making it an American sweep in the heartland. 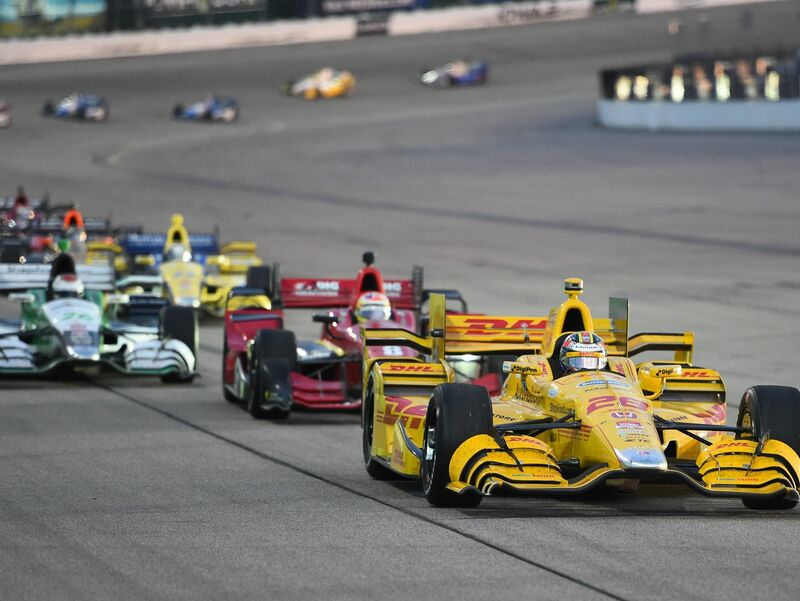 Andretti Autosport’s Carlos Munoz rounded out the top five in a favorable night for Andretti‘s team. 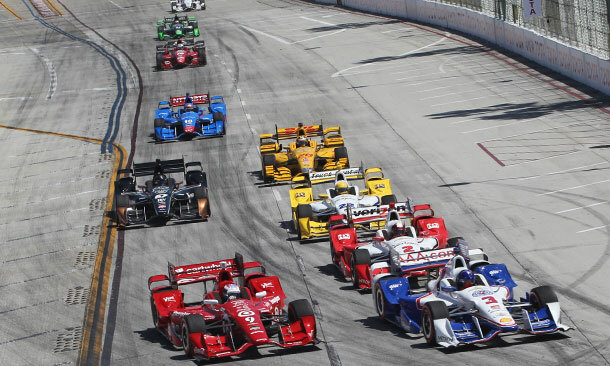 Sparks flew throughout the last half of the race as intense racing and hectic traffic around the tiny oval led to drivers being either exhausted or enraged or both. Karam enjoyed another rocket ride to the front in the number eight car. Were it not for a slow right front tire change during his last pit stop he might have fared even better. 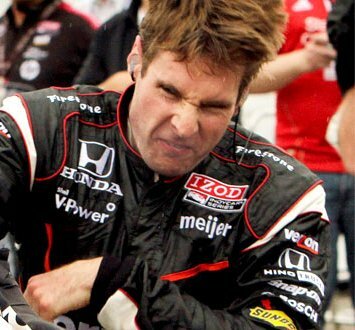 At one point Sage simultaneously showed his immaturity and fearlessness, screaming about Jack Hawksworth on the radio. 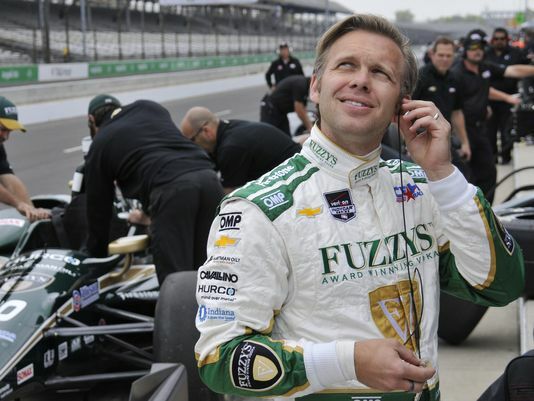 “Dude, I’m alongside him and he won’t back out!” Ed Carpenter appeared high on the list of drivers Karam managed to offend on his charismatic, choppy charge as the veteran gestured repeatedly from the car and then confronted the Ganassi driver immediately after the race. 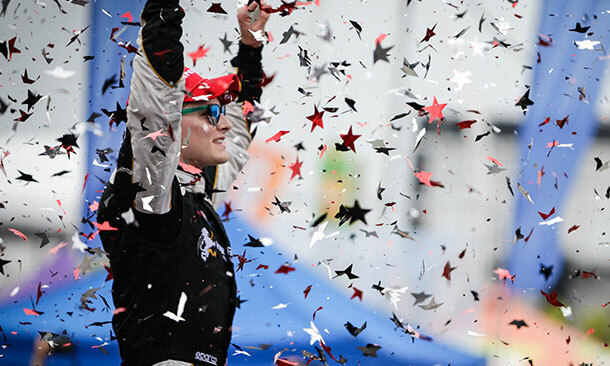 While NASCAR was rain delayed several hours at MIS – a track they stole from IndyCar, thank you Roger Penske – another classic IndyCar street fight broke out in what two time race winner and authentic Canuck Paul Tracy called “one of the best races I’ve ever seen at Toronto.” American Josef Newgarden won his second race of the season and his career as team owner Sarah Fisher – who happens to be female – shed tears of joy after the newly merged team went 1-2 with Italian Lucca Filippi. 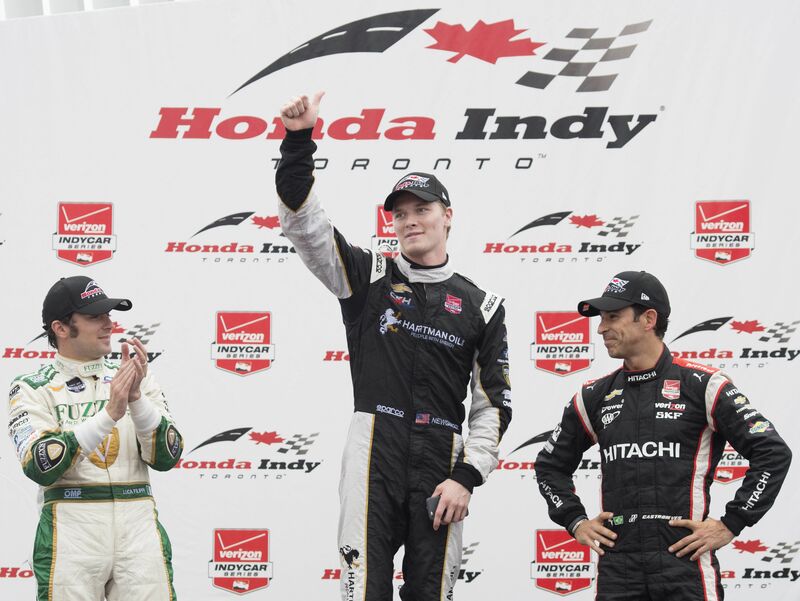 After disappointing in qualifying, Newgarden won from an 11th place starting position taking his second win in the last seven races. 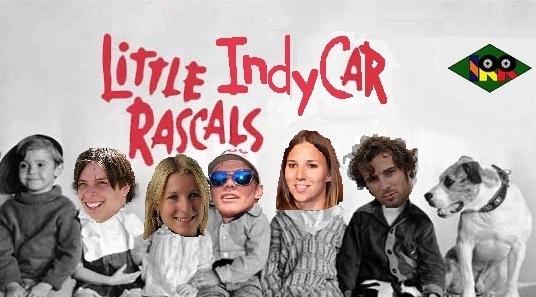 Despite absolutely awful renditions of both national anthems by Canadian rock group The Trews – which saw drivers and WAGS trying not to laugh on camera – IndyCar put on a helluva race in Toronto. 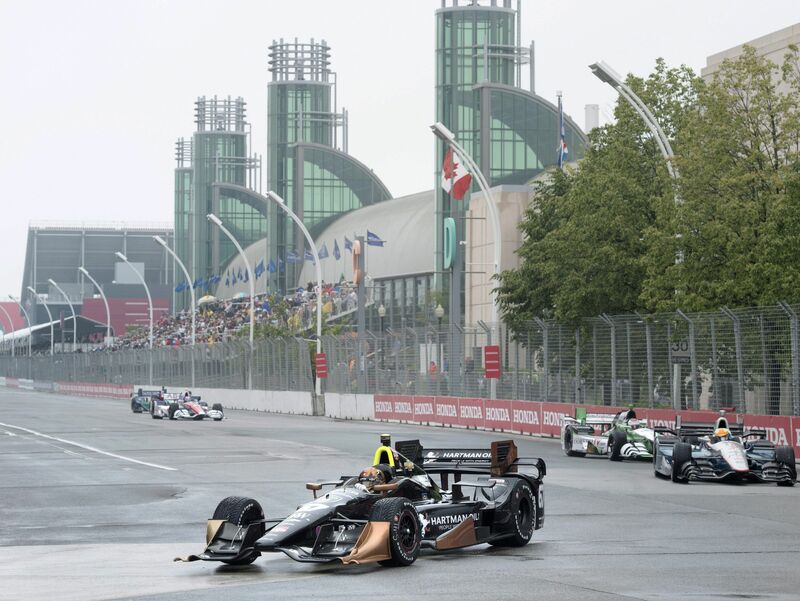 With collisions galore in the wet and then dry conditions there was hard racing, action and passing all afternoon and merely two yellows – half the recent race average and fewer than expected on the wet streets of Exhibition Place. All the gnashing of teeth about another timed race, NBCSN not showing the number of laps, and so forth was all for naught as the race went the full eighty five laps in the end. 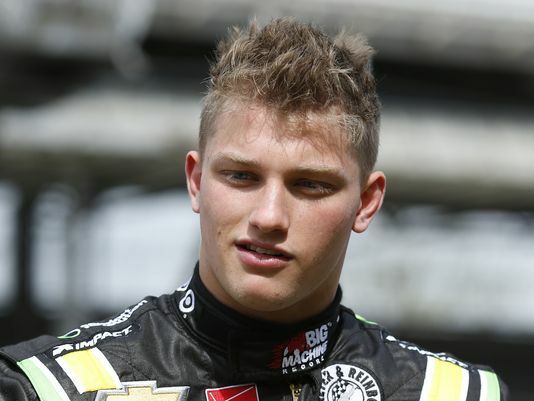 Team mates got thickly into the fight, with Filippi and Newgarden, Power and Pags, and Gonzalez and seemingly everyone else fighting it out on track. 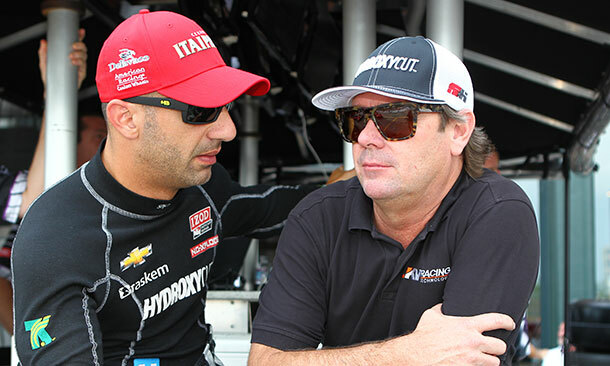 The banging began immediately when Stefano “double secret probation” Coletti hit Frenchman Tristan Vautier on the opening lap, spinning them both. 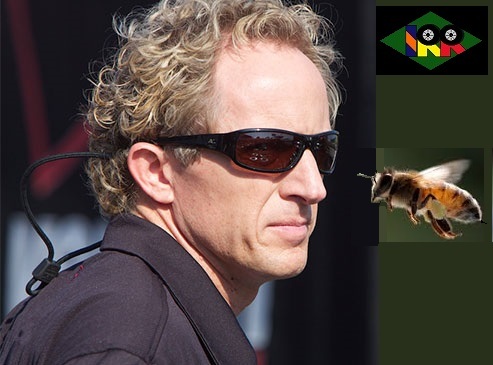 Flaunting his probationary status, the Monacan tangled with others during the course of the event too, later making contact with Charlie Kimball. Fortunately none of those incidents drew a yellow, though further penalties will be forthcoming. 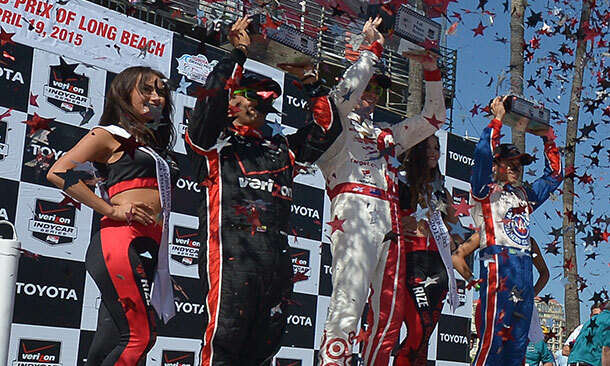 New Zealand’s Scott Dixon triumphed for the first time in nine tries in his storied career at the Long Beach Grand Prix. Surprisingly, the Target driver’s best previous finish and only top ten at the track nearest his homeland was a 4th place in 2010. 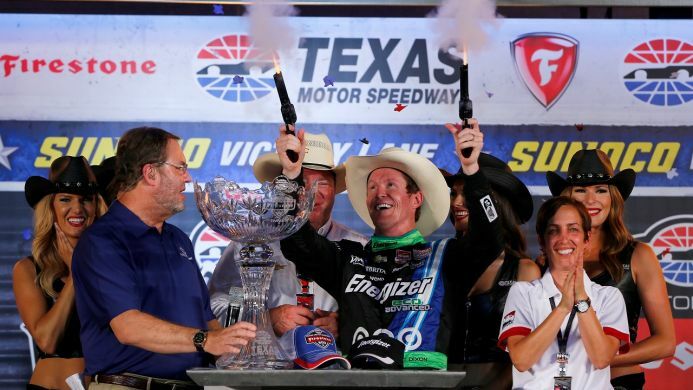 It’s the “Ice Man’s” thirty sixth IndyCar win putting him fifth all time behind Al Unser and Michael Andretti, whose records are both well within reach. 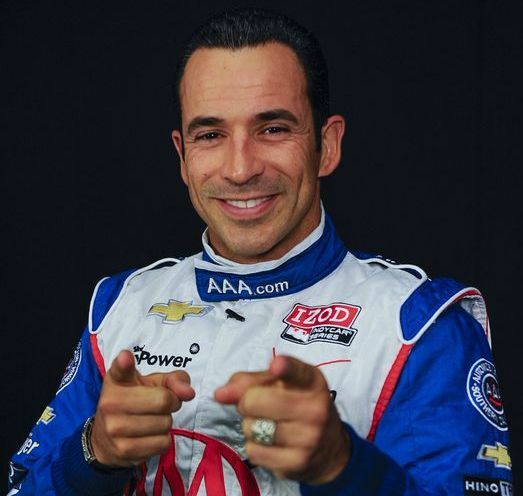 Dixon passed Castro-Neves during pit stops as Helio hesitated waiting for Tony Kanaan to enter his pit box directly in front, and then opened up an insurmountable lead. 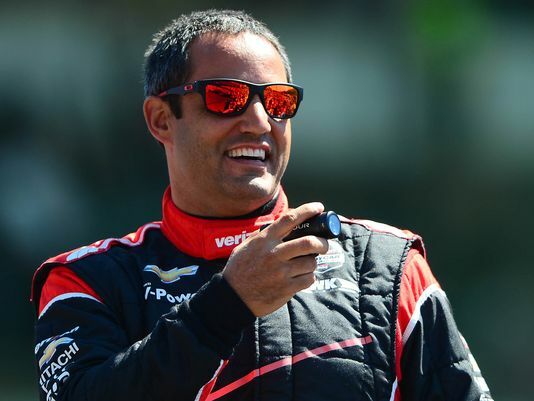 The Penskes swept positions two through four with Helio, Montoya and Pagenaud, the former two battling it out to the very end. 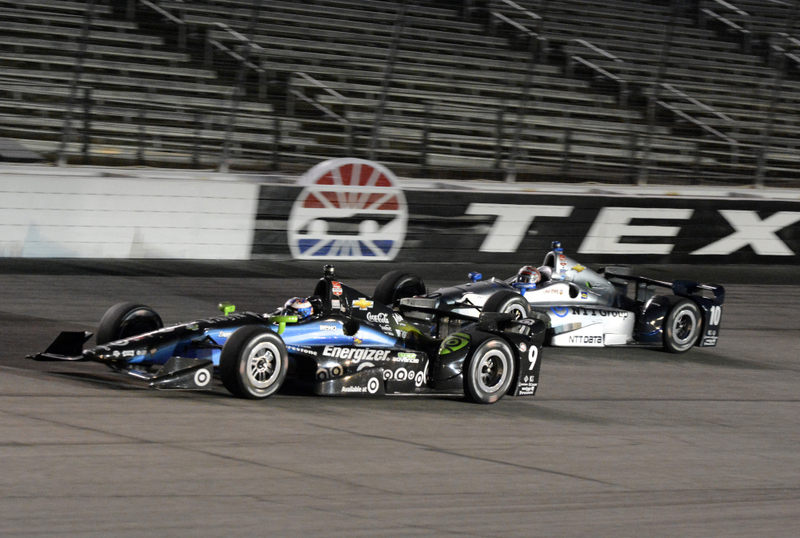 TCGR’s Kanaan took fifth, followed by KV’s Sebastian Bourdais and CFHR’s Josef Newgarden in 7th. 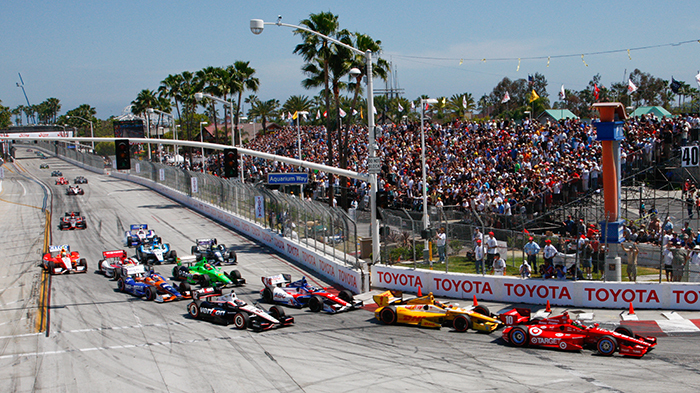 Marco Andretti rebounded at Long Beach with an 8th place finish and top Honda after starting 10th. His team mate Carlos Munoz finished ninth while Sebastian Saavedra came in 10th in his first race back since a disappointing 2014. 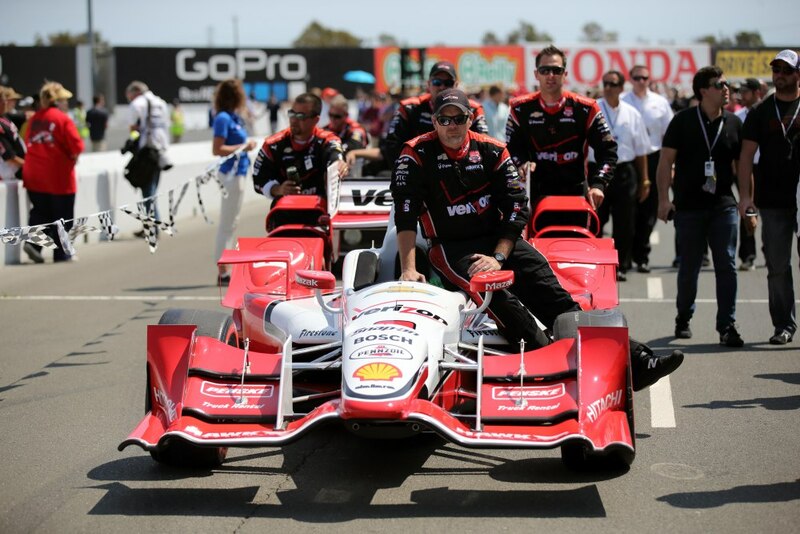 Penske’s 2014 Champion Will Power struggled all weekend, starting 18th and finishing twentieth after stalling on pit road. 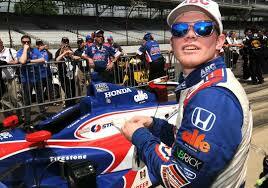 Hoosier Conor Daly jumped into the Coyne car as a late substitute and raced from 21st to 17th, making the biggest gain of the race. A study in contrasts to last week at NOLA, there was qualifying yesterday that actually counted – a real plus for both the fans and series. Under sunny skies, before a decent crowd and with no controversies to speak of from race control, the three knockout rounds went off without a hitch. 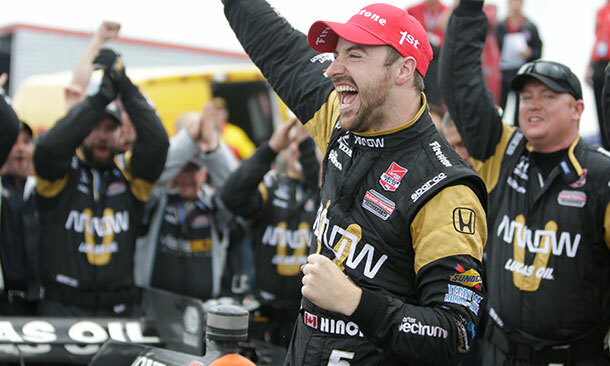 That is, except for recent race winner Hinch. 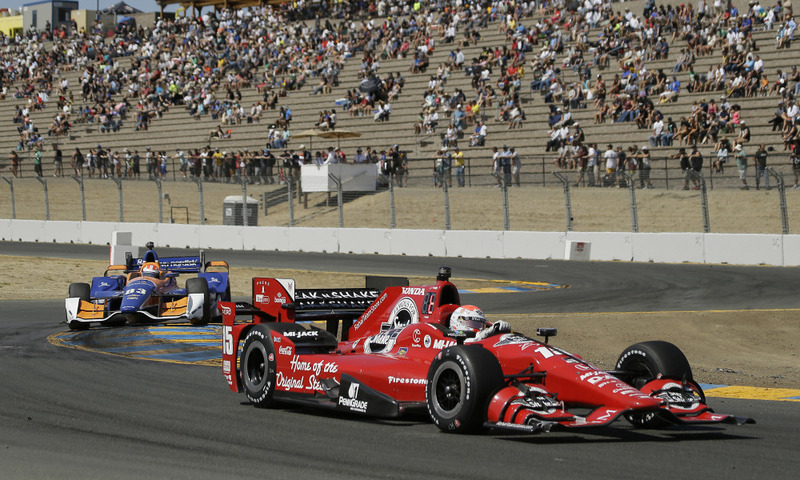 There were several interesting items to come out of the storm cancelled qualifying session including Target’s resurgence and particularly Kanaan’s, a swamp becoming even swampier, and the mouth of the north Paul Tracy squeezing back into the broadcast booth. 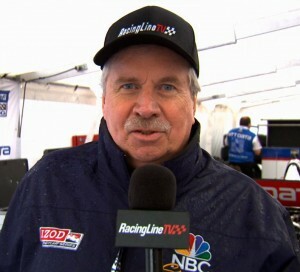 Heck, NBCSN even put Robin Miller on television again this season. Yet there were two still curiouser stories that emerged Saturday evening that caught our eye. 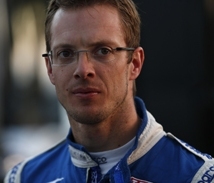 The first story of note was a controversial call made by IndyCar’s race control penalizing KV Racing’s Sebastian Bourdais for impeding TCGR driver Tony Kanaan’s lap. Turns out it’s all a moot point with qualifications being called off, but race control docking SeBass his fastest laps looked questionable particularly considering the poor conditions. 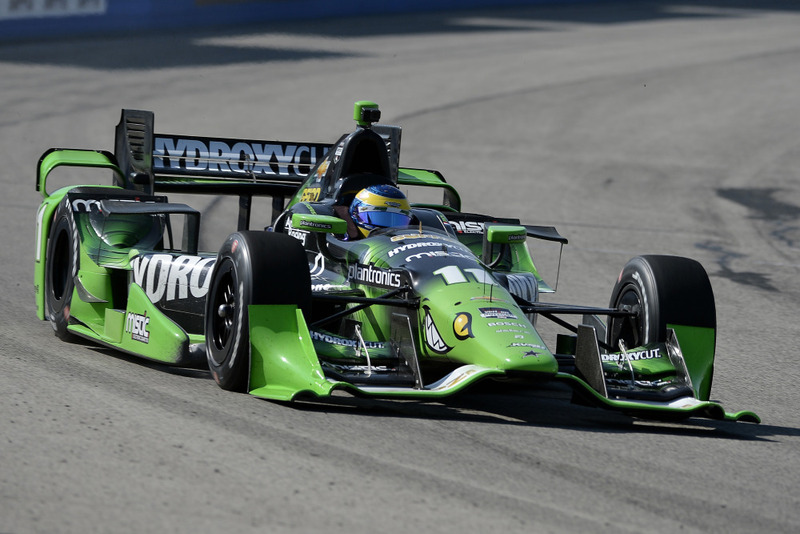 Bourdais ran off track into a runoff area, turned around and then re-entered the fray ahead of Tony Kanaan who he then let pass. 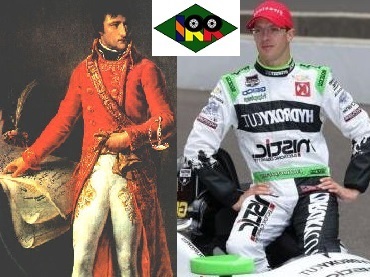 Both cars were set to advance until race control acted with an iron fist. Twitter – partly due to IRR’s instigation we admit – was immediately set alight.